Supafest got a little bit bigger again this afternoon. Not content with already having the likes of Ciara, Snoop Dogg, Timbaland, Bow Wow, Taio Cruz, Nelly and T-Pain on the bill for the 2011 tour, organisers last week announced that both Game and Fat Joe had been added to the line-up. They’re all joined by Busta Rhymes, New Boyz, DJ Benny D, Will Adamz, Israel, Miracle and DJ Nino Brown. 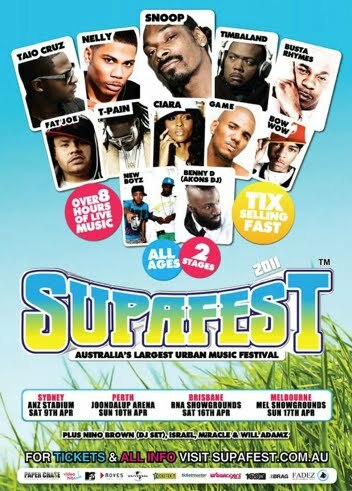 But if that wasn’t quite enough for Australia’s R&B and urban fans, Supafest today announced their final guest for this year’s tour – Keri Hilson. The US R&B star was included in the initial line-up for last year’s inaugural event, but pulled out because her schedule prevented her from taking part. But 12 months on, local fans will finally get the chance to see her in the flesh. So with nine hours of stonking great R&B all on the one bill, what are you waiting for!? Grab your tickets now via Moshtix from the links below!